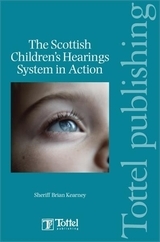 The provisions of the Children's Hearings (Scotland) Act have completely re-organised the system and also introduced many new concepts and procedures. This book provides useful and accessible guidance to the many disciplines which are involved in the working of the systems, including panel members, social workers, reporters, safeguarders and advocacy workers, as well as judges, sheriffs, members of the Faculty of Advocates, solicitors, those involved in the training of panel members and other participants in the system. The Children's hearings (Scotland) Act 2011 - A User's Guide is an accessible text to both students and professionals.